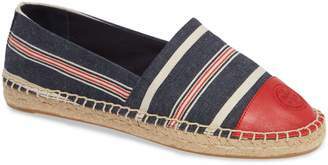 Tory Burch canvas espadrille. 0.3" braided-jute platform. Round leather-capped toe with logo medallion. Slip-on style. Padded footbed. Flocked outsole. Imported.